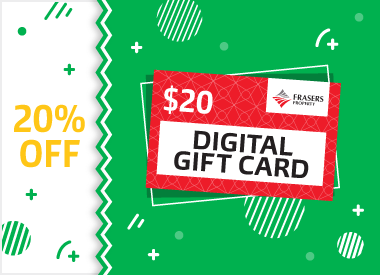 Get 20% off $20 Frasers Property Digital Gift Cards! 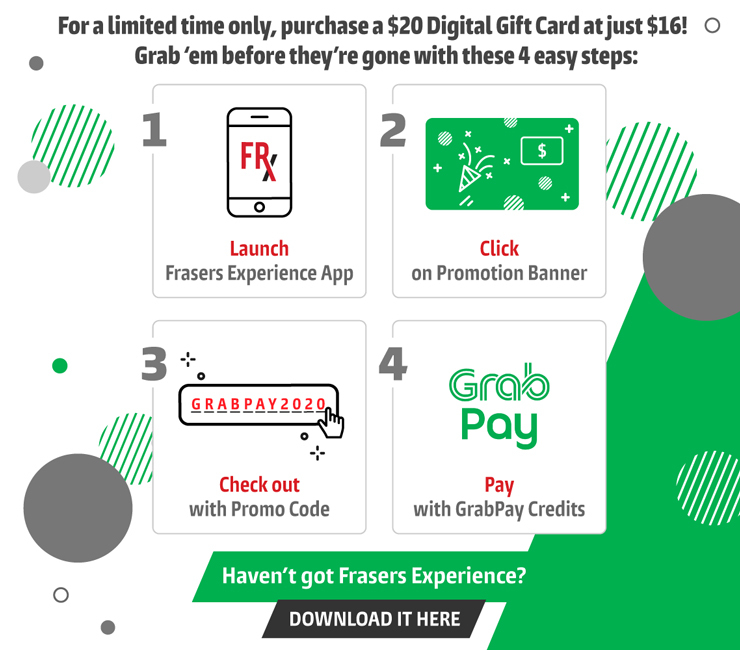 From 12 April, purchase a $20 Digital Gift Card via your Frasers Experience (FRx) app for just $16 when you pay with GrabPay Credits! Ready up your mobile phones! Starting 12 April at 10:30am, snag 20%* off when you purchase $20 Frasers Property Digital Gift Cards via your Frasers Experience (FRx) app when you pay with GrabPay Credits. Be sure to sign up as a Frasers Experience member to qualify for this promotion - membership is FREE! *Limited to a maximum of 5 Digital Gift Cards per Frasers Experience member. This offer is only applicable to the first 20,000 digital gift cards purchased. Consumer advisory - Frasers Property Retail Management Pte. Ltd (FPRM), the holder of Frasers Property Digital Gift Card stored value facility, does not require the approval of the Monetary Authority of Singapore. Consumers (users) are advised to read the terms and conditions carefully. Purchasers are required to download the complimentary Frasers Experience (FRx) app and sign up as a FRx member to qualify for this promotion. From 12 April 2019, each member may purchase up to 5 Frasers Property digital gift cards at the discounted rate, while stocks last. This promotion applies to the first 20,000 digital gift cards purchased on the FRx app. During this promotion, each digital gift card will be sold at $16 (a 20% discount) and loaded with a $20 value should payment be made with GrabPay Credits. The stored value in each digital gift card expires 1 year from date of purchase. Digital gift cards are accepted at participating retailers ("Gift Card Participating Merchants") at the malls managed by FPRM ("Frasers Property Malls"), the full list of which may be obtained from http://bit.ly/FrasersDGC. Digital gift cards once sold will not be refunded. An in-app confirmation will be sent when digital gift card(s) are successfully added to member’s FRx e-wallet. Payment confirmation will be reflected in the Grab app. FPRM will not be held responsible for any unsuccessful transactions due to insufficient GrabPay Credits or any other reason. For any payment related enquiries, please contact Grab Help Centre. For any further assistance, please email FRHelp@frasersproperty.com.